The 909th Air Refueling Squadron is part of the 18th Wing at Kadena Air Base, Japan. It operates the KC-135 Stratotanker aircraft conducting air refueling missions. The squadron was first activated in 1942 as the 19th Reconnaissance Squadron, but was redesignated the 409th Bombardment Squadron shortly after activation. After briefly serving as an antisubmarine unit, it participated in combat in the Mediterranean and European Theaters of Operations, earning two Distinguished Unit Citations for its actions. After the surrender of Germany the squadron returned to the United States and was inactivated. The squadron was reactivated shortly after the end of World War II as a Boeing B-29 Superfortress unit, and became one of the first units of Strategic Air Command in 1946. It was inactivated later that year when its parent group was replaced by the 43d Bombardment Group. The 909th Air Refueling Squadron was activated in 1963 at Amarillo Air Force Base, Texas. The squadron supported Strategic Air Command operations from activation and, starting in 1964, supported operations in Southeast Asia from Amarillo, March Air Force Base, California and Kadena Air Base, Okinawa. After the end of the Vietnam War, the squadron continued to support refueling and reconnaissance operations in the Pacific. In 1985 the 409th and 909th squadrons were consolidated into a single unit. The squadron also provided support for combat operations in Southwest Asia during the 1990s. The 909th is the Pacific Air Forces (PACAF)'s "lead force" for air refueling U.S. and allied aircraft during contingencies. The squadron accomplishes aeromedical evacuations for military and civilian members, transporting patients to as far away as the United States when necessary. It also conducts Strategic Arms Reduction Treaty (START) and headquarters- and command-directed missions. The squadron was established as the 19th Reconnaissance Squadron in early 1942 at Barksdale Field, Louisiana as one of the original four squadrons of the 93d Bombardment Group. The squadron was formed from a cadre supplied by the 44th Bombardment Group and was equipped with Consolidated B-24D Liberators. Shortly after activation the 19th was redesignated as the 409th Bombardment Squadron. It completed its Phase I training at Barksdale. The squadron moved to Page Field, Florida, and flew antisubmarine patrols over the Gulf of Mexico and the Caribbean Sea until the end of July. Its parent group claimed the destruction of three U-boats while stationed in Florida. Two weeks later the squadron began to deploy to the European Theater of Operations. Its ground echelon sailed aboard the RMS Queen Elizabeth on 31 August, arriving in Scotland on 1 September. The air echelon transferred to Grenier Field, New Hampshire, where it received new B-24Ds. It flew the first formation crossing of the Atlantic in September. 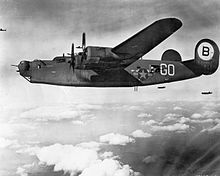 The squadron was a member of the first B-24 heavy bomber group to become part of VIII Bomber Command in England. It flew its first mission on 9 October against a steel factory at Lille. Until December, it operated primarily against submarine pens on the coast of the Bay of Biscay. The squadron flew some antisubmarine patrols with RAF Coastal Command from RAF Holmsley South. Later in the month the 409th transferred some of its personnel to the 329th Bombardment Squadron, which was training for special operations. In early December, the air echelon of the squadron deployed to Algeria, where it was attached to XII Bomber Command. Operating with inadequate supplies under difficult conditions the squadron struck heavy blows against enemy shipping and lines of communication during its Mediterranean deployment. Tafaraoui Airfield had no hardened runways, and the first four missions had to be cancelled when heavy rains turned the airfield into a sea of mud, making it impossible to taxi. After flying one mission, the unit moved to Gambut Main, Libya, where it came under the control of IX Bomber Command. At Gambut, dust storms "played havoc" with the engines of the squadron's B-24s. The 409th flew 22 missions, attacking enemy ports and attacking Italian supply centers to support the British Eighth Army. The squadron was awarded its first Distinguished Unit Citation for these efforts. The squadron returned to England in February 1943 and until June attacked engine repair facilities, power plants, harbors, and other targets in France, the Low Countries and Germany. In May the squadron was withdrawn from operations and began to train for night attacks. However, this training ended abruptly and the squadrons of the 93d group joined those of the only other B-24 group in Eighth Air Force, the 44th Bombardment Group, in flying diversionary missions, while Eighth's Boeing B-17 Flying Fortresses attacked primary targets. On 29 May the squadron was once again taken off operations and began practicing low level flights over England. Norden bombsights were removed from unit B-24s and a modified gunsight, optimized for low level attacks, replaced them. Liberators that had been modified for night operations were sent to another unit and bomb bay tanks were installed in others. In June, the air echelon returned to Libya and initially supported Operation Husky, the invasion of Sicily, flying ten missions. Following this, the unit resumed low level training in Libya. On 1 August, the squadron participated in Operation Tidal Wave, the low level attack on oil refineries near Ploiești, where 60% of the Axis fuel was produced. This attack involved a round trip of over 2,000 miles. The squadron's formation followed the 376th Bombardment Group which had mistaken the Initial Point for the bomb run and flew the wrong course to the target, bombing targets that had been assigned to other groups, despite heavy opposition from enemy forces that had been fully alerted to the approach of the bombers. For this action, the squadron earned its second Distinguished Unit Citation. Before departing the Mediterranean, the squadron flew an attack against the Messerschmitt Bf 109 factory at Wiener Neustadt, stretching the range of its B-24s and requiring it to recover at bases in Tunisia, which were closer than its station in Libya. The squadron returned to England in August, but flew only two missions before the air echelon returned to the Mediterranean to fly missions from Tunisia to support the Fifth Army at Salerno during Operation Avalanche, the invasion of Italy. The crews and aircraft returned to England in October. From England, the squadron resumed strategic bombardment raids against marshalling yards, aircraft factories, chemical plants, and oil refineries in Germany. The squadron also made tactical attacks on gun emplacements near Cherbourg during Operation Overlord, the Normandy invasion, in June 1944 and attacked troop concentrations during the Saint Lo breakout the following month. In August and September, its bombers were diverted to airlifting food, gasoline, water and other supplies to Allies advancing through northern France. It also dropped supplies to airborne troops engaged in Operation Market Garden airborne attacks in the Netherlands. Near the end of the war, on 24 March 1945, the squadron dropped supplies to airborne forces near Wesel and bombed a night fighter base near Störmede during Operation Varsity, the airborne assault across the Rhine. The squadron ended combat operations in April, and began returning to the United States in May and June. The ground echelon sailed aboard the RMS Queen Mary and received thirty days leave upon arrival. In July the 409th was inactivated when its parent group began conversion to Boeing B-29 Superfortresses. The squadron was activated again at Pratt Army Air Field, Kansas in August where it began to train with Boeing B-29 Superfortresses. At the end of the year the squadron moved to Clovis Army Air Field, New Mexico. In the spring of 1946 the squadron became one of the first units assigned to the new Strategic Air Command, and in June it moved to Davis-Monthan Field, Arizona, where it was assigned to the 444th Bombardment Group. In October the 444th group and its squadrons were inactivated and their mission, equipment and personnel were transferred to the 43d Bombardment Group. The 909th Air Refueling Squadron was organized at Amarillo Air Force Base, Texas in Apr 1963. Once the squadron was combat ready in July, half of the squadron's aircraft were maintained on fifteen-minute alert, fully fueled and ready for combat to reduce vulnerability to a Soviet missile strike. The squadron trained with Boeing KC-135 Stratotankers and conducted worldwide air refueling and participated in Strategic Air Command (SAC) directed exercises. The 909th deployed to refuel tactical units in Southeast Asia as part of Operation Young Tiger and deployed crews and planes to Spain and Alaska for support of Operation Chrome Dome airborne alert forces. The squadron also supported Operation Arc Light B-52 strikes in Southeast Asia. The 909th maintained combat proficiency at Amarillo until June 1966, when it moved to March Air Force Base, California, where it was assigned to the 22d Bombardment Wing, which became a "super wing" with two bombardment squadrons and two air refueling squadrons assigned. From May to October 1967 the squadron was non operational as the 22d wing was reduced to a small rear echelon non combat organization with all its tactical resources allotted to SAC organizations involved in combat in Southeast Asia. The unit rotated aircrews to Southeast Asia from 1967 to 1973. In 1971 SAC decided to maintain a permanent tanker presence in the Pacific and the squadron moved to Kadena Air Base on Okinawa. The squadron supported the tanker task force at Kadena (Giant Bear) and reconnaissance operations (Rivet Joint and Cobra Ball). In 1991, the squadron was transferred to Pacific Air Forces and reassigned from the 376th Strategic Wing to the 18th Operations Group. The 909th provided air refueling in Southwest Asia during Operation Desert Storm from August 1990 to March 1991. In 1996 it revisited Southwest Asia to support Operation Desert Strike, an attack against fixed surface-to-air missile sites and air defense sites in Iraq. Wikimedia Commons has media related to 909th Air Refueling Squadron. ^ a b c d e f g h i j k l m n o p q r s t u v w x y z aa ab ac ad Robertson, Patsy (27 May 2010). "Factsheet 909 Air Refueling Squadron (PACAF)". Air Force Historical Research Agency. Archived from the original on 12 January 2015. Retrieved 6 March 2014. ^ "Factsheet 18th Operations Group". 18th Wing Public Affairs. 11 September 2007. Archived from the original on 3 March 2016. ^ "Abstract, History Davis-Monthan Field October-November 1946". Air Force History Index. Retrieved 28 August 2013. ^ "Abstract, History 461 Bombardment Wing Jul 1963". Air Force History Index. Retrieved 11 March 2014. ^ "Abstract, History 461 Bombardment Wing Oct-Dec 1965". Air Force History Index. Retrieved 11 March 2014. ^ "Abstract, History 461 Bombardment Wing Apr-Jun 1965". Air Force History Index. Retrieved 11 March 2014. ^ "Abstract, History 461 Bombardment Wing Jan-Mar 1965". Air Force History Index. Retrieved 11 March 2014. ^ "Abstract, Vol. 1, History 376 Strategic Wing Jul-Dec 1988". Air Force History Index. Retrieved 11 March 2014. ^ "Abstract, Vol. 1, History 376 Strategic Wing Jan 1996-Dec 1997". Air Force History Index. Retrieved 11 March 2014. ^ Activations and inactivations of the 909th Expeditionary Air Refueling Squadron in the monthly Organization Status Change Report, Research Division, Air Force Historical Research Agency. Stout, Jay A (November 2003). Fortress Ploiesti: The Campaign to Destroy Hitler's Oil Supply. Archived from the original on 22 June 2010. Retrieved 4 February 2009. Dugan, James; Stewart, Carroll. Ploesti: The Great Ground-Air Battle of 1 August 1943. Retrieved 26 March 2009. The 93rd Bombardment Group Museum, Station 104, Hardwick. A small museum on the actual airfield site in Nissen (Quonset) and brick built huts.